Patrick Hardy was born and raised in Wetaskiwin. As a youngster growing up with two competitive brothers, Patrick was naturally involved in sports. He played through the minor hockey ranks in Wetaskiwin and then played junior “B” hockey in Camrose (this was before the time of the Wetaskiwin Icemen). Patrick also coached hockey at the Peewee level and refereed. Besides playing hockey, Patrick was involved in Wetaskiwin’s Minor Fastball system. 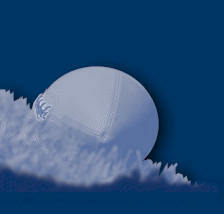 After minor fastball Patrick played for two years in the Senior Men’s ‘AAA’ Sunburst Baseball League. Patrick is also an avid golfer golfing to a single-digit handicap and still plays hockey with the Usona Oilers. However, Patrick is being honoured for his outstanding ability, his achievements and his contributions in the sport of football. Patrick played high school football with the Wetaskiwin High School Sabres from 1984-1987. 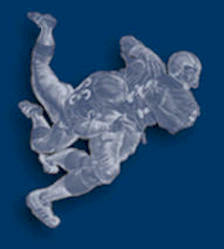 During his stint with the team he played mostly linebacker, some running back as well as returning punts and kick-offs. Throughout his high school career he scored five touchdowns on special teams, two touchdowns on interception returns and one touchdown on a fumble return helping the Sabres to win two Central Alberta League Championships in 1986 and 1987. Patrick was named League All-Star in 1985, 1986 and 1987 and in 1986 and 1987 he was named the Sabres Defensive Player of the Year. Patrick’s leadership ability was acknowledged as he was voted Team Captain in both 1986 and 1987. For two years after high school (1988, 1989) Patrick played Junior Football in Kelowna with the Okanagan Sun. In both years the Suns won the BC Junior Football League Championship. As well, in 1988 they won the National Championship for which they were awarded the Armadale Cup. During his tenure with the team Patrick played Safety, Halfback and Corner. 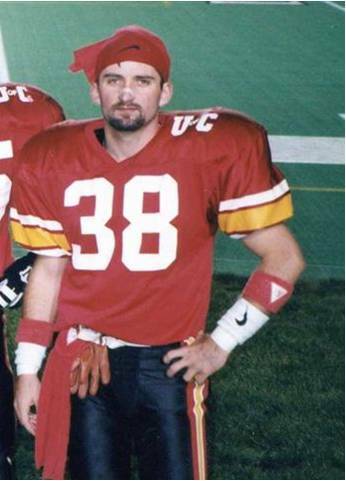 Patrick’s passion for and participation in football continued when Patrick attended the University of Calgary. There he played for the Calgary Dinosaurs for five years, 1991, 1992, 1994, 1995 and 1996. For over 50 games with the Dinos Patrick was a starting player playing Halfback and Corner. In 1992 and 1995 the Dinos were Canada West Champions and in 1995 they won the Vanier Cup as National Champions playing against the Western Ontario Mustangs in the Skydome in Toronto. 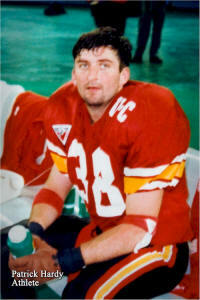 In the final five games of 1995, Patrick had six interceptions including two in the Vanier Cup final, a shared record that stood until 1998. Patrick’s enthusiasm, ability and leadership qualities were rewarded again when he was named the Dinos Team Captain in 1996 and was voted to the Canada West All-star team. Patrick’s outstanding football career in high school, at the junior level and at the university level is worthy of recognition and it is with pleasure that we induct him into the Wetaskiwin and County Sports Hall of Fame.